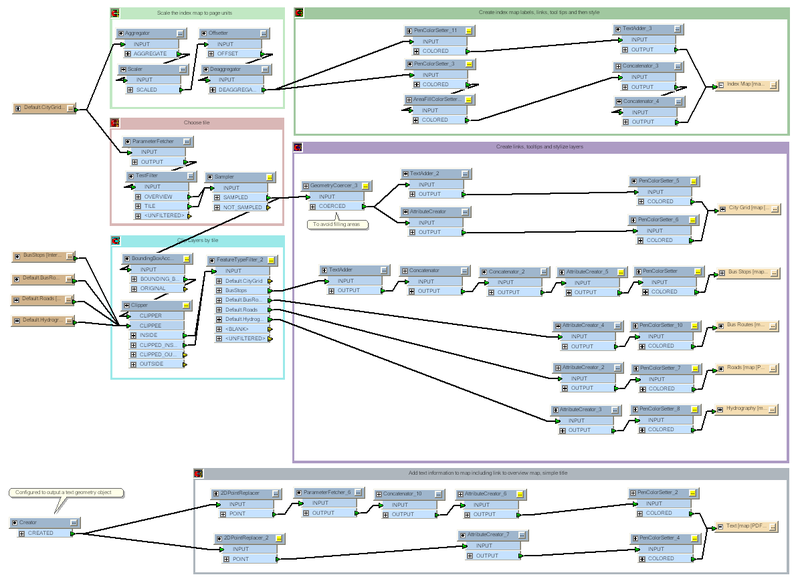 This example is set up and running on Safe's FME Server demo site. There are no installation requirements other than a standard web browser. You can try it out by clicking the Live Demo link at the top of this page. Select an index tile from the choice list and then click run. The PDF map will be generated and then you can click on a tile in the index map to generate a PDF of another area or even an overview map of all the tiles. Try turning a few of the layers off or viewing the attributes of a feature using the Layer and Model Tree sidebars in Adobe Reader. A screenshot of the workspace used. As with most FME Server scenarios, a Spatial ETL process (workspace) is designed using FME Desktop (Workbench) and uploaded to FME Server. The workspace reads municipal data from a number of layers, restructures the content and outputs PDF format data. The workspace also provides an option to restrict the display to an individual city tile or an entire city grid. In addition, a clickable city grid index map is provided with links to re-run the workspace for a different city tile. When published to FME Server it is registered with the Data Streaming service. When the workspace is run from the FME Server Web User Interface it returns PDF format data directly to Adobe Reader. Clicking on one of the city grid index map links will re-run the workspace for the specified city tile. the data is styled for PDF and then routed to output feature types. the data is styled for PDF and routed to an output feature type. To actually set up and run the example on your own FME Server installation requires a certain set of software and setup. Download the zip file containing the files for this example and unzip it. 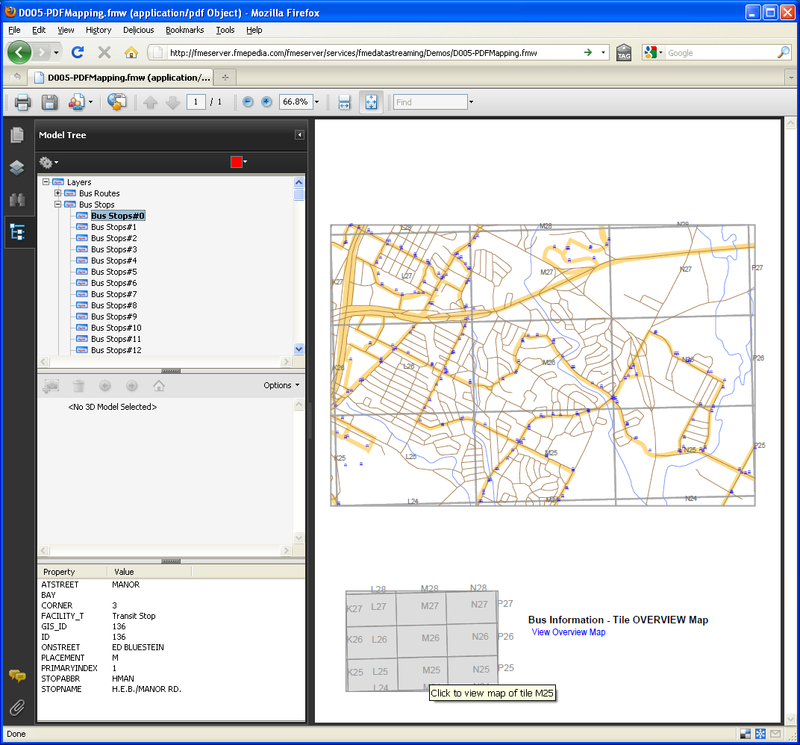 Open the 'D005-PDFMapping.fmw' workspace in FME Desktop 2014. Set the FME_SERVER_URL published parameter to the FME Server you are using. Change the InteropolisDatabase source dataset path so that it uses a path that is accessible to the remote computer. Publish the D005-PDFMapping.fmw workspace into a repository named Demos and register it with the Data Streaming service. Note: ensure that the InteropolisDatabase is selected under upload files. Open the FME Server web interface, and find the workspace you published. On the configure page: use the Tile Name parameter's ellipsis button to select a tile name and click the Run button. The workspace will run and the PDF file will be opened in Adobe Reader. The PDF contains a city grid index map that you can click in order to re-run the workspace for a different tile and provides a new PDF file. There is also a link to view an overview of the full city grid, which also re-runs the workspace and provides a new PDF file at a smaller scale.